Our WindTamer™ Brand Motorcyclist Ear Plugs represent the latest advance in hearing protection against both impact and constant noise. WindTamers provide variable noise reduction that increases as the volume increases. In practice, this means you can clearly hear voices and other traffic sounds in low noise environments, then instantly and automatically get the protection you need in the presence of dangerously loud noises, such as the wind noise at highway speeds. WindTamers are rated at NRR19 which provides adequate protection up to approximately 105 dB of constant noise, or for shorter periods in higher noise conditions. In low noise situations such as riding in city traffic, you will hear with almost no attenuation, and at high noise conditions such as you typically encounter at highway speeds, you will hear approximately 25% of the loud noise you would hear with no protection. WindTamer ear plugs feature the world famous Hock's Noise Braker noise filter, and a 6 flange plug that fits teens through adults with small to average sized canals. WindTamer ear plugs can be cleaned with ordinary soap and water for daily use over months or even years. WindTamer ear plugs are recommended for all kinds of motorcycle riding including city, highway and motocross racing, plus industrial environments up to 105 dB, and for outdoor range shooting and for hunting. Each pair of WindTamer Motorcyclist Ear Plugs comes with a durable watertight carry case and instructions for use. WindTamer™ Motorcyclist Ear Plugs5Roger from FloridaNovember 9, 2018Here how this goes. I am thrilled with them. They hold back just the right amount of noise. I know this because I rode 1,200 miles and when I took them off my ear I could still hear very well as in normal, Other ones (rubber similar to these did not work). AMUST for easy insertion, I used a shoelace and inserted it the ends of the plugs & it stiffened them just enough. Cannot loose tham that way. Great product. WindTamer™ Motorcyclist Ear Plugs4GeneOctober 21, 2018This is my second purchase of these ear plugs. I have very small ear canals and these are the most comfortable I have been able to find. No longer ride but they are great for working around power tools etc. and I can still hear the stereo when the tools are off. Comfortable enough that I don't have to constantly remove them. WindTamer™ Motorcyclist Ear Plugs1Harry drakeJuly 8, 2018These did not seem to work for me, not a good seal or noise reduction. WindTamer™ Motorcyclist Ear Plugs5MikeSeptember 29, 2017I tried 2 different types of ear plugs for long motorcycle rides and these were my favorite of the 2. They cut down on the noise and allowed me to talk to others when at a stop. WindTamer™ Motorcyclist Ear Plugs5JLambrightSeptember 8, 2017This is my second order of 3 pair. I ride without a helmet on a loud Harley and they meet my needs perfectly. If you're looking to completely block out all frequencies use the foam style, these have a specific design to allow certain frequencies to pass and they work as advertised. WindTamer™ Motorcyclist Ear Plugs1DaveJuly 28, 2015I was hoping for a lower cost version of the nonoise motosport plugs. Even half as good would have been OK. It does OK for high pitch wind noise but greatly increase the low frequency booming noise of the wind around the helmet. I had to stop after 5-10 miles to switch out to a pair of cheap disposables. WindTamer™ Motorcyclist Ear Plugs4BillJune 7, 2015I bought a pair several years ago and found that they very slowly harden so that they become more and more difficult to insert. What I think is happening is that residual ear wax is interacting with the rubber while they're sitting in the case. What I do now is keep the case filled with water while the plugs are being stored. It gets rid of the wax and hopefully will prevent or delay the hardening. I'd forgotten how nice they originally fit. WindTamer™ Motorcyclist Ear Plugs5MichaelNovember 25, 2014I like these earplugs. They work well, are comfortable, and most important, they have long stems that enable me to pull the plugs out of my ears. They are very reasonably priced. I'm going to buy more. WindTamer™ Motorcyclist Ear Plugs2Barry FeigOctober 6, 2014Had a concussion several month ago and tested many plugs. These just didn't offer the quietness of the foamies. and after a while, they hurt from the pressure. Admittedly, the foam plugs are a royal pain, but I was able to ride. BTW the concussion was not from a motorcycle. WindTamer™ Motorcyclist Ear Plugs5BpkAugust 24, 2014These are the best earplugs I have found hands down. I re-ordered a spare set immediately and a set for a friend. Perfect!!! WindTamer™ Motorcyclist Ear Plugs1sharpAugust 21, 2013I feel I have an average ear/size but these were way too small. I purchased other cheaper sets and they worked better. I have a ringing in my ear and it gets louder when I drive. WindTamer™ Motorcyclist Ear Plugs5JohnAugust 6, 2013When in the Air Force I wore Extra Small ear plugs but can no longer find that size anywhere. Child-size plugs are even too large. The Wind Tamer will fit in my ear more comfortably than the Howard Leight Clarity small size ear plug (which fits better than the North Com-Fit triple flange green small plug), But even the Wind Tamer is still a bit too large. Wind Tamer has good performance in stopping noise. WindTamer™ Motorcyclist Ear Plugs5Ron MooreJuly 10, 2013These do a good job of staying in my ear while riding, but with my Shoei helmet they don't do a good enough job keeping the wind noise at bay. They are very good design, but just don't have enough noise reduction to be very useful. WindTamer™ Motorcyclist Ear Plugs4CBJuly 5, 2013These are very comfortable, can't tell they're in. They are a tad too small for my ear canals though as they don't fit tight as I'd like. They don't move around, but a bit larger would help block out more sound. They stay in great and are nearly invisible when in your ear. Other ear plugs make my ears ache like they are too big or something, but these don't, it's more because the way they are made versus not being tight in ears. Definitely worth the money if you ask me. Helps reduce wind noise all around, but will notice more at town speeds versus interstate speed. They still help at all speeds though. WindTamer™ Motorcyclist Ear Plugs5Eli RodgersMay 30, 2013Love the plugs! First earplug that I have used that cut the wind noise and still let me hear traffic, etc. The plugs I have used previously bothered my ears, and my hearing "after" wearing them. Not so with the Windtamers. Excellent product. 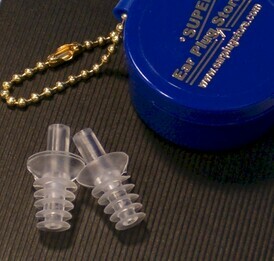 WindTamer™ Motorcyclist Ear Plugs5MarkFebruary 20, 2013Excellent product. Quick international postage as well. WindTamer™ Motorcyclist Ear Plugs5Brian KMay 24, 2012The WindTamer is a great solution for motorcycling. I can still hear important traffic sounds; but a pleasant surprise is how well I can hear my own bike. I ride often on city and suburban streets and hearing the engine, transmission, and traction sounds is a cue I rely on to stay safe and within my comfort limits. I've been riding for a year and wish I had purchased these last spring when I got my license. I wear a helmet that muffles most of the wind noise, but the benefits to hearing the traffic and my bike made these worthwhile - even under that helmet. WindTamer™ Motorcyclist Ear Plugs5LindaMay 21, 2012I love them! I have a ruptured eardrum and have had to wear a full helmet. Now I wear a half helmet and enjoy the wind! WindTamer™ Motorcyclist Ear Plugs5paul whiteApril 17, 2012Great to keep the wind noise down to a minimum. I am sold. Bought 2 sets in case I lost one. No need to spend lots of money on fancy plugs when these work well and are comfortable. Well worth the purchase. WindTamer™ Motorcyclist Ear Plugs5Frank MMarch 24, 2012great ear plugs to usr around town. Takes enough wind and noise away to feel comfotable. Longer highway trips I use the nrr-26. I wear the windtamer on short slower rides. Great product good fit and comfortable. Fell like the are not in your ear. I wear a half helmet they do there job. WindTamer™ Motorcyclist Ear Plugs5JennyNovember 12, 2011I have very tiny ear canals, and I have an inner conch piercing (inside the curve of the ear), so buying ear plugs can be very difficult. Even with the helmet on, these plugs are comfortable. I can comfortably hear people talking to me with the plugs in and the a full face helmet on, but once I get on the road, they block wind fairly well. The noise reduction is not perfect, but it's the best I've found :-) I've been using them since 2008. I lost them somehow, though :( I purchased a pack of 3, and if I don't find the other two pairs soon, I'm going to place another order. These are, without a doubt, the best ear plugs I've ever used! WindTamer™ Motorcyclist Ear Plugs4RobApril 29, 2011This are pretty good, but not great. I don't think they would offer enough protection for longer highway rides, but for a half an hour or so, they are fine. Great for around town and highway commuting. They allow more ambient sound to be heard, but seem to reduce the harsh wind noise. They also seem to let your ears breathe more than disposables. WindTamer™ Motorcyclist Ear Plugs3TylerMarch 7, 2011The product is good quality, but the reduction was not enough for me. The fit is nice, but may be too small for larger canals. I'll probably take out the Hock's and place them into a different pair of reusable plugs. WindTamer™ Motorcyclist Ear Plugs5ToddDecember 29, 2010Great fit and variable noise reduction. Best use is around town in traffic. Very comfortable and stay seated nicely. I also bought a pair of Silent Ear plugs that offer more noise reduction at highway speeds. I recommend both!